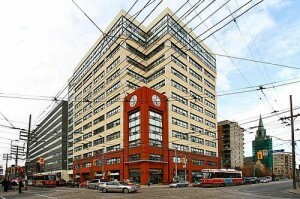 Rare Corner Loft W/ 2 Full Walls Of Windows & Sweeping City & Lake Views! Gorgeous Custom Kitchen W/Centre Island, Caesarstone Counters, Glass Tile Backsplash, Slate Floor, White & Wood Grain Lacquer Cupboards! 2 Full Baths Renovated W/ White Marble & Granite Topped Vanities. 12′ Ceilings, Exposed Pipes & Duct work, Sliding Barn Doors, Custom Komandor Closet Doors, Closet Organizers, Rich Wood Flrs, Loads Of Storage, Parking & Locker! 2 bedrooms + den, 2 bathrooms, with 1 parking space and a locker.